Happy first day of March! I honestly can't believe it's March already, this year is already flying by at such a quick pace, I'm going to need it to slow down! I will say, the one thing I am super excited for is the warmer weather. Summers can be brutal down here but the spring and fall (what we actually get of those seasons) is gorgeous. Some days can be a bit cooler than others but the sunny, mid 70's days make you want to spend as much time as possible outside. On the weekends I have been living in these AE boyfriend flannel tops, they're super comfortable and look cute with just about everything! I literally have these flannels in three different colors now and the black and white one is next on my list! I wore this outfit out running errands on Sunday evening after laying out by the pool for a bit. It was super comfy since I was slightly burnt (whoops!) and still warm since it had slightly cooled off. I love wearing flannel shirts, long sleeves and lightweight sweaters with shorts during the spring and fall months to transition. I'm also a big fan of booties and cute dresses during these months. I always find it super fun to mix warm and cool weather "trends" and come up with the perfect outfit. I love this outfit.. So cute and casual! I can't believe is March either! That is seriously my FAVORITE type of outfit for everyday. Those shoes are perfect! I have them in black and wear them all the time. Have a great day!! 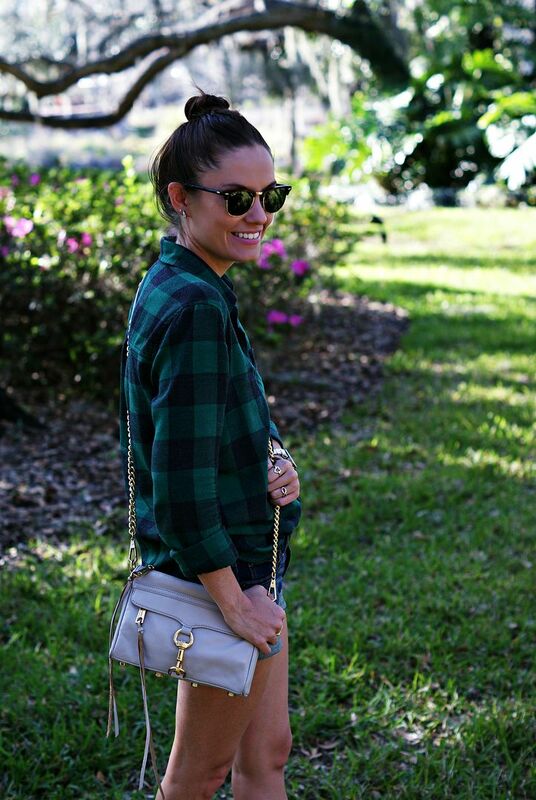 Super cute, love the green plaid! I can't believe it's March either! Love this look. I need those jean shorts- they're perfect! That shirt is everything! I'm going to check out their site to see if I can snag one. I've been on the hunt for the perfect white flannel! Love this! A perfect transitional outfit! I'm ready for warmer weather, too! love the outfit! you know i love all your flannel shirts. Meanwhile i have like two ha. so cute. i'm ready for warm weather but i wouldn't hate if it stayed this temperature all year long! so cute!! perfect outfit for this time of year. so jealous of your pool time!! Love a good flannel and the color of this one is so perfect, love it on you! You are adorable! Love that shirt so much! Such a cute casual cool outfit! Love that flannel and your hair looks so adorable like that! You are the cutest! Love your hair here and I love a flannel with shorts, such a great look! I can’t wait to be able to layout again! A good flannel shirt find is worth buying more than one! This is such a cute outfit girl! I have a similar color flannel and love how comfy it is! I need to pick up those AEO shorts! I love that look! I'm a big fan of flannel! Have a great day! I love this green plaid on you! This is such an easy & cute weekend look! ooooh i love it. and i love the black and white one.. need it. i am so looking forward to warmer weather, our summer will probably be like your spring and fall, lol. but seriously, can't believe it's march already! I got a flannel from Old Navy (so cheap!) a few months ago and it has been on repeat! Love your sunglasses too! Cute and casual outfit for weekend errands! I only have one flannel shirt and would never thought to pair it with jeans but now you've proven that they can go great together! I wish it was warm enough here to wear that! So cute!! Love the flannel with shorts! I can't wait to break out the shorts here.....in about 4 months, haha! This looks like the perfect outfit for running errands on the weekend! Like you said, the flannel is the perfect transition piece because you can always roll up the sleeves if it starts to get warm. Love this outfit! And I am with you about March! I cannot wait for the temps to warm up, I am over the cold weather. I love this easy breezy look--you look chic and comfy all at the same time! Love this comfy cute style! And love your bun! Oh, and I'm stunned it's March - it feels like it was just the holidays! Definitely with ya on looking forward to warmer weather! I'm in the midwest and my shoulders haven't seen sunlight in months! That is the perfect flannel top...so cozy and cute! This is basically my go-to outfit on the weekends during warmer weather months! You can't beat Chucks! Love this outfit. I still can't get over how clean your chucks are. You look so cute and chic! Love the top! I love this outfit! It's almost warm enough to wear shorts out & about around town and I am so ready to do so. Such a great casual look -- I love that top! Can't wait for warmer weather! Gorgeous gal! Love that plaid and jealous you're already in shorts! This is so cute! I love the flannel!